Hey everybody! Did you hear the news yet? I announced the week 1 giveaway winner on Twitter and Facebook. But if you weren't able to catch it, just click the links to see. And now that we've got the week 1 giveaway down, here comes WEEK 2! Amazeballs, right? Little Louie's Cupcakes loves you THAT much! 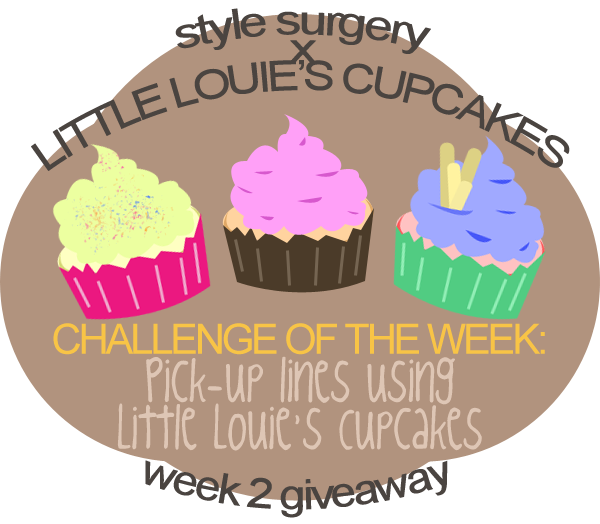 You can use Little Louie's Cupcakes, their cupcake flavors, or cupcakes in general :) Be creative!! * Entries will be accepted until Saturday (April 14, 11:59PM) and will be announced on Sunday (April 15). * TWO winners will be drawn via Random.org and will win a box of assorted cupcakes each from LLC!